When I first moved back to Indiana in 2010, I was discovering new (at least, to me) shops right and left. 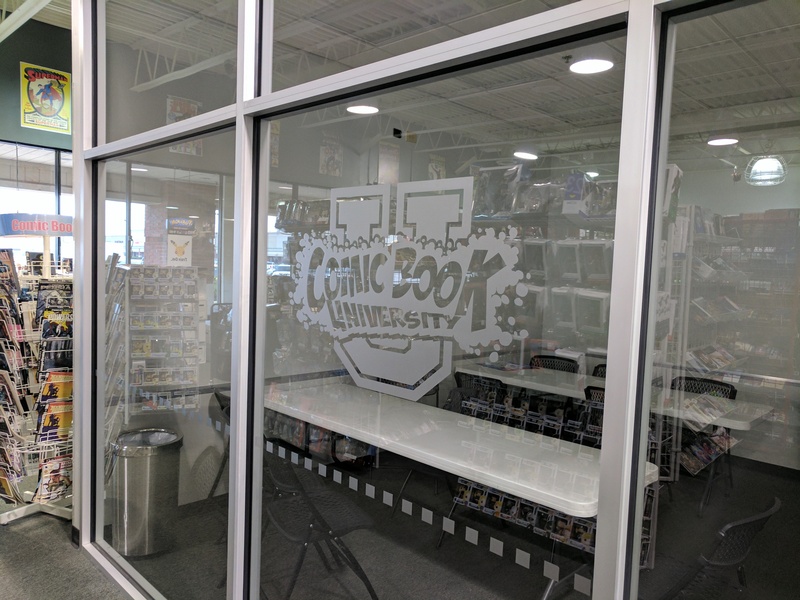 One of the shops I visited was Comic Book University, in their old location which was well-stocked, though cramped. In 2013, I had the opportunity to visit their new, larger location on Shelby Street, east of Greenwood Park Mall, and loved their new store, and everything they had to offer. 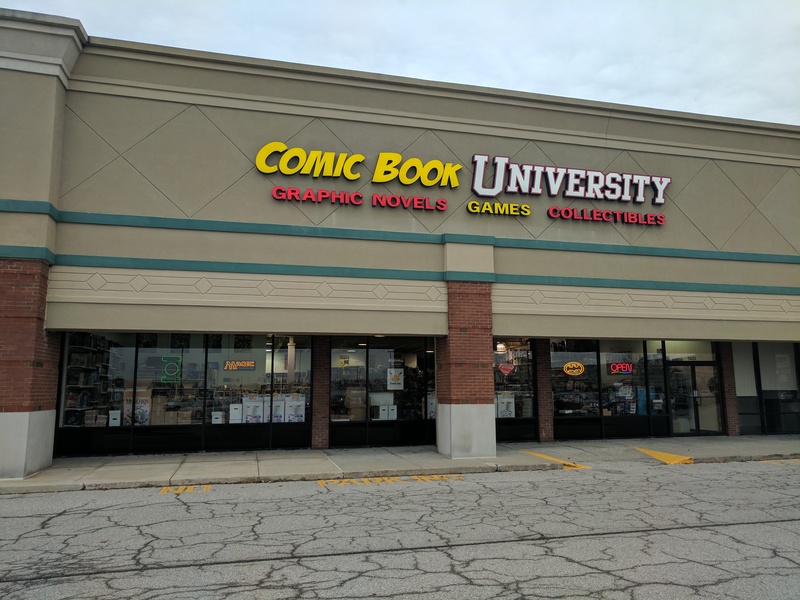 Located in the shopping center off Shelby St. and 31, between The Room Place and United Arts & Education, CBU is the place to go for comics in the Greenwood area. It has an outstanding selection of comic books and graphic novels, a good selection of games, and there are toys and collectibles on endcaps and displays throughout the store. Not only does it have a great selection, it is very clean and, for the most part, organized. 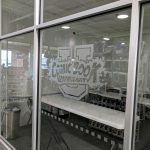 Not only do they have a lot of product, they also have two enclosed rooms with windows for walls that can be used for gaming, or group meetings. I know over the past few years, I’ve attended meetings of the Indy Webcomics Group, as well as a get together of local costumers, in the rooms, and they work fantastically. It’s really cool seeing shops dedicate space like this to both gaming and the community, especially space that can be kept quiet with shut doors. Normally, when I walk into the store, I’m greeted by a staff member and asked if I need any help, even when it’s busy. The only time I have never been acknowledged in the store until I was ready to check out was this past visit, in fact, where the staff members were engaged by a loud (not mad, just… loud) customer who, by appearances, wasn’t letting them focus on the other customers because ME, ME, ME!!! I mean, we all know the type, right? Either way, both guys were very friendly once the loud dude left, and after that I had the normal pleasant check-out. 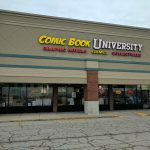 Comic Book University is one of the good comic shops here in Indiana. If you’re in the area, and have never visited, I strongly recommend you rectify the situation. Here’s what you need to know! What is their parking situation? The strip mall they are located in is good sized, and they have ample parking. Just kidding on the phone number! Internet! Where are they online? You can visit their website, check out their Twitter Feed, and connect with them on Facebook! Totally agree with you. Love this place. They have such diverse products (comics/ graphic novels, toys) as you mentioned, and I also love the tabletop games figures, and Magic selection!